The Bosch FlexiDomeXT line of vandal resistant, fixed dome cameras with varifocal lens options provide the ultimate solution for virtually any indoor and outdoor security application. Providing a full-featured integrated camera in a cast aluminum housing, polycarbonate dome, and hardened inner liner the FlexiDomeXT can withstand the equivalent of 120lbs of force. FlexiDomeXT cameras are also sealed for outdoor use with protection against water and dust to IP66, (NEMA-4) standards. 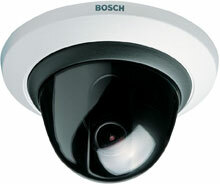 The Bosch VDC455V03/20 is also known as BOS-VDC455V0320	or VDC455V0320	.